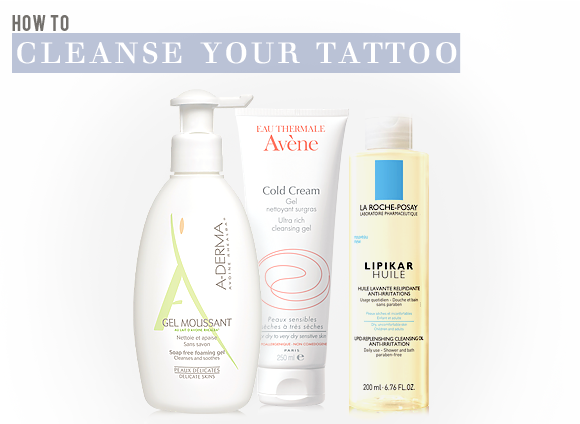 Last week I told you all about how to moisturise your tattoo – now its time to clean your tattoo! Keeping your tattoo clean is essential in the healing process; after all it is an open wound and acts like a brush burn so it should be treated as such. Initially your tattooist will advise you to keep the tattooed area under cling film from anywhere between 2-24 hours, just to let it settle. It is then really important to make sure that you cleanse the area, to get rid of any excess ink and blood, but also because the tattoo will start to ooze fluid to lubricate itself (not the prettiest process in the world I’ll admit!) so try to keep the tattoo as clean as possible to prevent infection. It doesn’t matter what method of aftercare you use (be it keeping it covered or letting it get some air) but you have to cleanse it to help it recover quicker and easier. As long as the cleanser is gentle on the skin and is alcohol and fragrance free you’re generally on to a winner but I’ve chosen 4 products which are great for skincare generally and extra good on tattooed skin. A-Derma is an excellent brand for sensitive and dry skin and their products are always formulated to be the gentlest they can be. Cleansing but also nourishing, this Soap Free Foaming Gel is packed full of Rhealba Oat extracts which are rich in polyphenols that help to regulate moisture in the skin and gives it an added boost. This is very helpful when you’ve had a tattoo as it helps to clean the skin, but also calm it down so it isn’t as swollen or sore. This is a good product for anyone who needs to get their tattoo clean but may not have enough time to give it a proper wash. It has a thicker consistency than a lot of cleansers but can be easily applied to the skin and any excess can be wiped off to avoid stickiness. Formulated for optimal tolerance, it is soap, alcohol and paraben free so it respects the skin whilst cleansing and moisturising. Niacinamide helps restore the cutaneous barrier of the skin which aids in the soothing process, and shea butter is used for intensive lipid replenishment. It sounds fancy, but all you need to know is that it’s moderately priced, very gentle and it works! This is a brilliant little product, rather obscure, but a bargain find and a miracle worker. High praise indeed but it is definitely worth it. The formulation is a soothing combination of organic extra virgin coconut, olive, jojoba and hemp oils together with pure essential oils, which creates a soap that cleans effectively without being aggressive. It produces a velvety-lather that leaves the skin smoother and refreshed. It comes in a range of scents (Almond, Rose, Tea Tree and many more) and because they only include natural ingredients you don’t have to worry about harsh chemicals or synthetic agents, plus they smell amazing. I’ve tried a couple in the range but I have to say that this extra mild baby version is the best. It’s unscented so if you want a squeaky clean, moisturised tattoo but don’t want to smell like an almond, you don’t have to! It has a very watery consistency so get your flannels at the ready because you don’t want to waste any of this. Remember, clean it with formulas that are alcohol and fragrance free and you can’t go far wrong. If you use the wrong cleanser it makes the healing process a whole lot more difficult when it doesn’t need to be! I have wanted to try this oil ever since it was launched. Now I finally got it and I am positively surprised. It cleanses very gently (just for armpits you might want to use something stronger) and is not really that oily (unlike other shower oils where you feel like you are taking a bath in a deep fryer..). People with dry body skin will have to apply another product after showering, whereas for people with normal/oily body this oil might be enough moisture. The scent is super subtle and very pleasant. This entry was posted on Wednesday, January 23rd, 2013 at 9:01 am and is filed under Hints & Tips, Skincare, Special Post. You can follow any responses to this entry through the RSS 2.0 feed. You can skip to the end and leave a response. Pinging is currently not allowed.